I got my plant in 2008 from Henrik Zetterlund of Gothenburg Botanic Gardens and it has delighted me each year since. I grow it in my alpine house in a 15cm. clay pot in a compost made up of equal parts of JI3, grit and Perlite. I keep it almost completely dry in winter but water it liberally in summer. It flowers in July. The flowers encircling the stem are maroon with prominent yellow anthers. 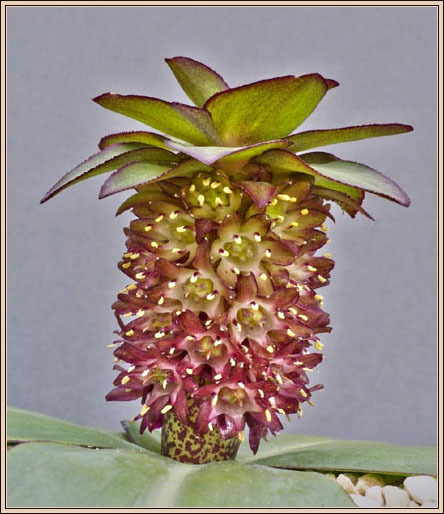 The genus Eucomis (Hyacinthaceae) contains twelve species of bulbs and comes from southern Africa, mainly South Africa. Several of the larger species, commonly called ‘Pineapple Flowers’, are widely grown in the border and, despite their exotic appearance are reasonably hardy although in colder areas they should be given winter protection or lifted and stored in a frost free place. E. schijffii, however, is hardy down to -5°C and is endemic to the Drakensberg Mountains where it grows in summer rainfall areas up to 3200m. 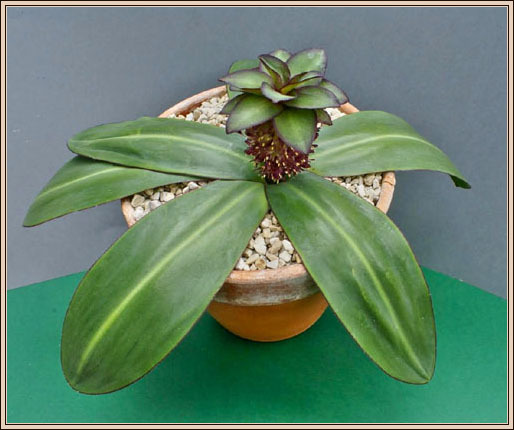 It is one of the smallest members of the genus, not exceeding 12cm when in flower and is a true alpine. While it is attractive in flower I think I like it best when the new foliage appears in late spring/early summer. 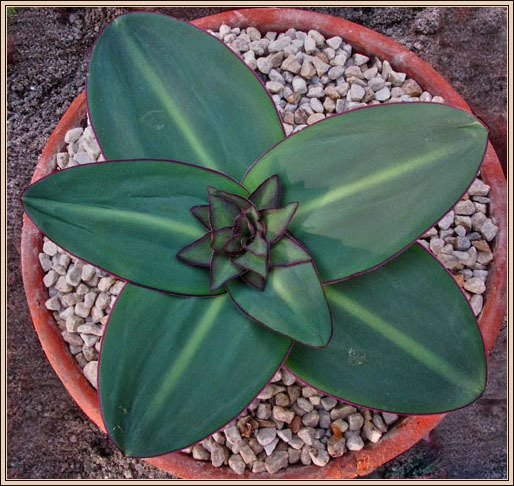 It forms a rosette of five to six broadly oval leaves which are bluish green with a purple margin. In the centre is a more congested, purple-flushed rosette, the coma, which remains at the top of the inflorescence. Propagation is by seed or leaf cuttings taken in June. I have collected some seed from my plant and I plan to try it outside in very well-drained soil, with some protection against excessive winter wet.